Undoubtedly the best thing about travelling on a cruise ship is all the different places you get to visit. On these ‘port days’ the aim is to see as much as you can of a place in the few hours that you’re there. The other kind of cruise day is a ‘sea day’, where you spend the whole day on the ship as it travels between destinations. The number of sea days varies depending on the cruise. Since we were onboard for a month and covering quite a bit of distance, we had a few of these – 6 back to back at one stage. To stop the 2600 passengers from becoming restless, the ship provides a list of day and night entertainment options. However a good chunk of our fellow cruisers were 60 + (on a Pilates class sign-up sheet I spied one day, three of the four sign-ups were called Carol – true story). Perhaps understandably, the activities were targeted towards them – carpet bowls tournaments and seminars on back pain available daily. I tended to avoid these but, experiencing a bit of FOMO in the last couple days of the cruise, I lurked at the back of one of the seminars by the onboard motivational speaker. I can’t tell you what the inspirational message was because I left 10 minutes in, when the speaker told us to “start every morning by picturing yourself getting into your own canoe”. Maybe I’m just lazy but my favourite thing to do on board was to sit on the balcony with my Kindle and look out to sea. Sometimes you see land and you try and figure what (where) you’re looking at. In the Red Sea, I saw a pod of dolphins dancing in the ship’s wake. Most of the time though it’s hour after hour of endless ocean. I’ve realised that there’s nothing like travelling across the world on a ship to make your life feel small. You see quite a few other ships as well of course – container ships, oil tankers etc. Other cruise ships in the distance at night, their lights blinking ethereally in the distance. We also might have seen some pirates. Apparently the area off the coast of Somalia has been a real hotspot for pirates in the past. 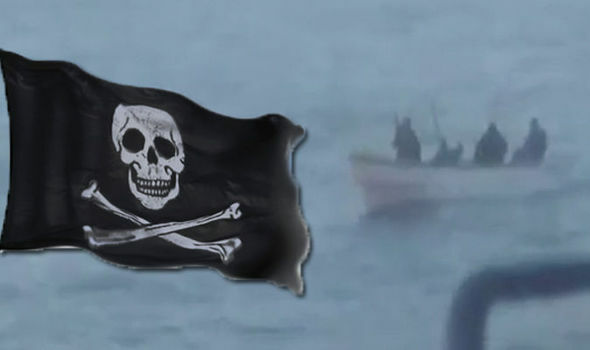 These pirates operate in small boats, using guns and grenades to attack ships – cargo typically, but cruise ships have been targeted in the past. Before we left home I read a Daily Mail article about how some pirates attacked a cruise liner a few years ago – passengers stopped them climbing up the side by throwing deck chairs at them. The picture below is from another incident, where the ship raced away from its attackers. Totally terrifying but so rare that you kinda just put it out of your mind. Then one day, when we were having dinner, I spotted the boat. Close enough to be able to see several tiny figures dotted across the boat, far enough away that I couldn’t see any more detail than that. Pirates? we speculated. I took a photo with my phone. The waiter came over, had a look out the window and seemed to think we were right. “Well they’re not there to do anything good. They’re not exactly fishing”. We laughed, not at all concerned – probably thanks to the copious amounts of limoncello consumed (it was Italian night). The next time I looked out, the view was back to its usual endless blue.